The Smithsonian National Air & Space Museum was the original museum home of space shuttle Enterprise. The shuttle will eventually move to New York City and be replaced at the Smithsonian by Discovery. NASA on Friday slashed its multi-milliondollar price tag for museums looking to acquire one of its three space shuttleorbiters after they are retired later this year. The due date for thereduced payment, which dropped by almost one-third, was also advanced to be sixmonths earlier than previously announced. Interested educational institutions and sciencemuseums will now only owe the space agency anestimated $28.8 million - down from the $42 million setin December 2008 - if they are chosen to receive either shuttles Atlantis orEndeavour. Discovery, the oldest of the orbiters, has been promised to theNational Air and Space Museum, although the Smithsonian will still need to paythe same fee. The lower price comes as a result of NASAreleasing the shuttles' recipients from having to underwrite the"safeing" of the vehicles, preparing them to be safelyexhibited. The museums will still need to pay for ferrying the orbiter atop theagency's modified Boeing 747 from NASA's Kennedy Space Center in Floridato a U.S. destination airport. While updating its formal Request for Information(RFI) to museums, NASA also revised its schedule for transferring the orbitersto begin six months earlier than previously stated in2008. 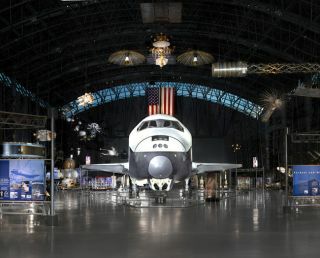 As such, the earliest NASA will announce the finalhomes for Atlantis and Endeavour will be in July 2010, giving the selectedmuseums approximately a year to fundraise and erect the required indoorhousing for the orbiters. NASA has set a Feb. 19, 2010 deadline forinstitutions to reply to the updated request in order to be considered toreceive an orbiter. In the interim, NASA is continuing to readyEndeavour to fly the first of five remaining shuttlemissions to complete the International Space Station. STS-130 isscheduled to launch on Feb. 7 on a 13-day mission to deliver the third andfinal connecting node for the orbiting outpost. VisitcollectSPACE.com for the latestupdates as NASA decides where to display its retired space shuttle fleet.